Bi-fold doors move on rollers sliding at the upper track, and, pivots at the outer top and bottom. There may be door aligners at the center where the two doors meet and, a spring bumper at the center track that absorbs the closing. At the bottom pivot; this is done by opening a half set of doors. 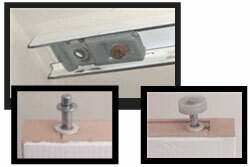 Lift the pivot door slightly at the outer base and move the bottom position in its bracket - in the direction of the center or toward the wall. Note that some of the lower pivot brackets have clip-ring inserts used for adjusting - if your brackets have these be careful, the plastic clips break off. Also, if central aligners are being installed, these should be put on last - after the doors are of equal height. To adjust the top pivot as needed, tape measure how much distance the door should be shifted from below. Untighten the top pivot screw and slide the pivot bracket into position, level with the pivot below, steadying the door and this may take a second person. Once into position, re-tighen the screw. Also, when working on the interior section, a flashlight may be needed for finding the phillips slot. If you need more access to the upper bracket, depending on your design, you might have to remove the whole double door section by depressing the upper pivot which is spring loaded, along with the accompanying roller. Transfer the lower door-edge to wall distance, to the top. As the door is adjusted, there must be a turning void at the door edge. The doors should have about the same distances for both outer door edges, left and right, and a small gap at the center, that does not not bind the two when closed. 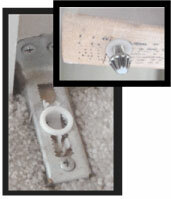 To adjust the door height alone, with the doors already in level, simply raise or lower the doors at the lower pivots by rotating the adjusting nut(s). As the doors wear, and especially for masonite doors, some have a tendency to begin wobbling when they swing. If your doors are unstable at the pivot, and the brackets are secure, pull the door sections completely off and check the pivot mounts in the ends. Frequently this means replacing the doors, or, replacing the internal door plug(s). Then installing new pivots. To replace the door plug - typically the plug width is 1 1/8" which is not dimensional stock so this will have to be ripped. First remove the current plug (pull on pre-drilled screws). Then sand the inside surfaces, and apply wood glue before applying pressure with a pair of wood clamps. Wipe of the excess and let dry. Once cured, seal both top and bottom ends, and let dry. Drill and place new pivot barrels and reinstall the doors in position. Note that most common replacement parts for bi-folds are available at local home centers, should any be failing or missing. However, make sure that any replacements will fit in with your basic hardware design, for example some bottom pivot brackets accept different pivot heads, newer pivot brackets probably have different hole placements, and all top pieces should slide on same dimension tracks.